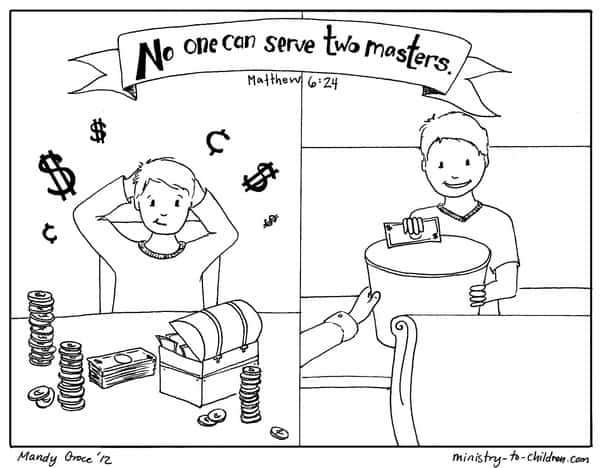 This free coloring sheet is based on Matthew 6:24 where Jesus teaches about the love of money. The illustration shows a young boy demonstrating what he loves most. In one picture, he is greedily counting his money. In the other, he is cheerfully giving his money back to God. Directions: Click on the preview image above to download this coloring page in printer-friendly format. We’ve also uploaded the image as a PNG file for advanced users to edit. We would love to hear how you will use this resource to teach your children about the love of money. Click here to leave a comment below. If you enjoy this sheet, be sure to browse all of our Bible coloring pages. 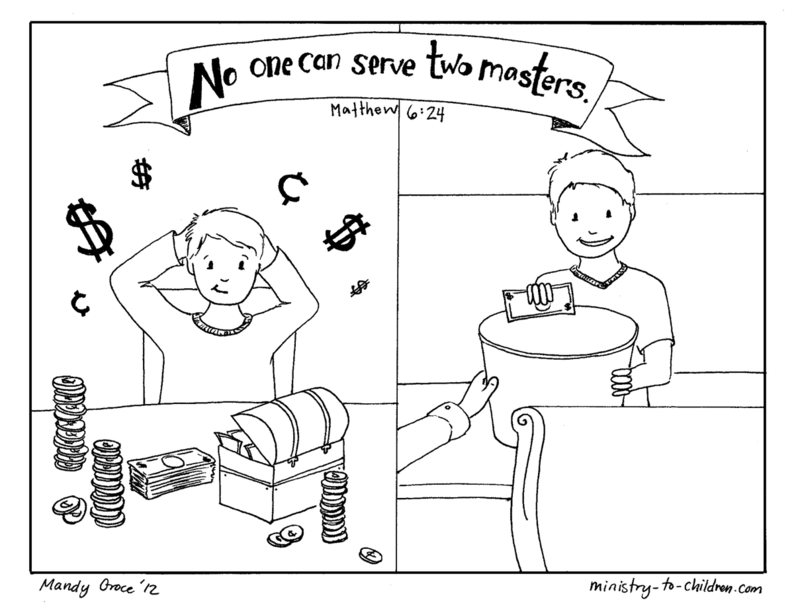 Related Resources: You can print our kids Bible lesson about the love of money. You might enjoy Mandy’s “Giving for Orphan care” illustration. We’ve also posted a simple object lesson about giving. Hi my name is Jill, I’m a youth group leader in the church..I find this amazing memory verses very helpful to my occupation has Youth Group leader in the church. It gives me an idea how to starts an activity to children especially on Sundays. Tony Kummer (Editor) reviewed & updated this page on : February 19, 2015 at 12:13 pm. All our content is peer reviewed by our readers, simply leave a comment on any post suggest an update.